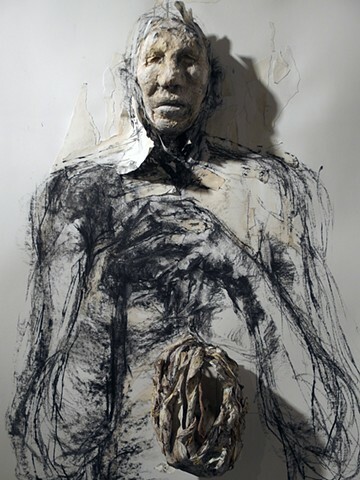 The installation drawing titled Painful Pleasure is both 2D and 3D–made of paper. The head is sculpted paper pulp, the nest/container is several types of paper, manipulated to simulate branches and vines. The drawing is comprised of charcoal, collage and coffee wash. The small head in the container is sculpted in wax.